The final rounds of the European Club Cup were characterized by the tense struggle and various creative achievements. It is impossible to present all interesting events and therefore I will have to leave out some encounters. However, I would like to mark out both the theoretical novelties and the games that became the most important for the results of the tournament. Artem Iljin managed to score an excellent victory in the topical opening system. His opponent followed a well-known game but the problem was that he didn't demonstrate any serious improvement of Black's play. 1.d4 ¤f6 2.c4 e6 3.¤c3 Ґb4 4.Јc2 d5 5.a3 Ґxc3+ 6.Јxc3 ¤e4 7.Јc2 c5 8.dxc5 ¤c6 9.cxd5 exd5 10.¤f3 Ґf5 11.b4 d4. The opponents play one of the sharpest variations of the Nimzo-Indian that has come into fashion after the game Kramnik – Anand (Dortmund 1999). 17.gxf6 ¤c3? 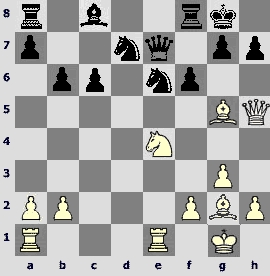 Black repeats the game Van Wely – Antonio (Turin 2006). The problem is that Kogan didn't prepare any serious improvement of this variation. Either there was some kind of an oversight during the home analysis or Kogan simply didn't know the latest news in this variation. After 17...¤xf6 18.¤d2 ¤xd2 19.¦xd2 0-0-0 White stands slightly better but it is still possible to struggle. 18.fxg7 ¦g8 19.¦a1 ¤xe2N. The encounter mentioned above finished very quickly: 19...0-0-0 20.Ґh3+ ўb8? (20...f5 is the only move) 21.Ґf4+ ўa8 22.¦c1 dxe2 23.¦xc3 1-0. The following continuation doesn't spare difficulties either: 19...dxe2 20.Ґg5±. 20.¤d2! Artem Iljin neutralizes his opponent's activity by strong and clear moves. Apparently, White uses all advantages of his position. 20...¤xd2? Black could continue resisting by 20...¤xc1 21.¤xc4 ¤b3 22.Ґxb7 ¦d8 23.¦d1±. Moreover, it looks like to be the only variation. 21.ўxd2 O-O-O. 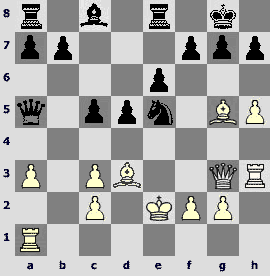 Now in case of 21...¤xc1 22.¦axc1 0-0-0 23.¦he1 White threatens with the rook's invasion to the 7th rank. If Black plays 23...¦d7, White simply moves 24.c6ќ. 22.Ґb2 ¤d4 23.¦ae1 ¤b3+ 24.ўc3! 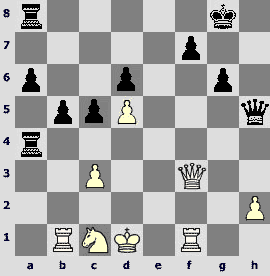 The position became very sharp but the fact is that White always controls it. 24...d2 25.¦e7! ¤d4. Neither 25...d1¤+ 26.¦xd1 ¦xd1 27.ўxb3 nor 25...¤xc5!? 26.bxc5 d1¤+ 27.¦xd1 ¦xd1 28.ўc4! ¦d7 29.¦xd7 ўxd7 30.Ґxb7 (the endgame is lost) could save Black. 26.¦d1 ¤b5+ 27.ўc4 Ґc2. The alternative is 27...Ґd3+ 28.ўb3 ¤d4+ 29.Ґxd4 ¦xd4 30.ўc3ќ. 30.ўb6! The impressive raid of White's king puts an end to this striking game. Let's keep analyzing the Nimzo-Indian Defense. Evgeny Bareev lost to Alexander Grischuk. However, it was not the opening that caused Bareev's defeat. White's position seemed to be very promising after the novelty on the 12th move. 1.d4 ¤f6 2.c4 e6 3.¤c3 Ґb4 4.¤f3 c5 5.g3 ¤c6 6.Ґg2 ¤e4 7.Ґd2 Ґxc3 8.bxc3 O-O 9.O-O ¤a5 10.Ґf4!White is ready to sacrifice a pawn for the following mobilization. 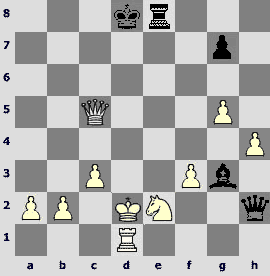 In the game Kasparov – Karpov (Moscow 1985) after 10.dxc5?! Јc7! 11.¤d4 ¤xd2 12.Јxd2 ¤xc4 Black had the upper hand. 10...d5 11.cxd5 ¤xc3 12.Јd3!?N. Formerly White played 12.Јc2. Bareev's move looks more attractive. 12...cxd4 13.dxe6. It seems to be logical to open the position for the white bishops but the problem is that Black has a serious counter-play. Perhaps, White can achieve an advantage after 13.d6!? 13...Ґxe6 14.¤g5 g6 15.¤xe6 fxe6 16.e3 ¤c6! Black keeps his knight on c3 using tactical motives. To my mind, the game is even. 17.¦ae1 ¦c8 18.exd4 ¤xd4. Alexander Grischuk goes on struggling for the victory. In case of 18...Јxd4 19.Јxd4 ¤xd4 20.Ґxb7 there are certain drawn motives in the endgame. 19.Јe3! ¦f7 20.ўh1 b5. If 20...¤c2 then 21.Јxe6 ¤xe1 22.¦xe1 and White doesn't take the risk. 21.¦c1 b4. It is also interesting to play 21...¤de2!? 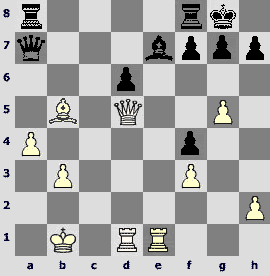 22.Ґg5 Јb6 although White doesn't have serious problems after the exchange of queens. 22.a3?! 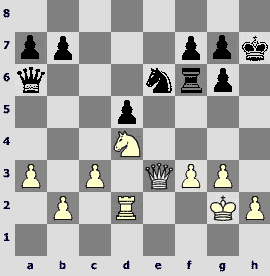 White should have defended e2-square by 22.¦fe1. 22...a5?! Black was wrong to reject 22...¤de2! 23.¦c2 (neither 23.Ґg5 Јb6 nor 23.axb4 ¤xc1 24.¦xc1 ¤d5 25.Јxe6 ¦xc1 26.Ґxc1 ¤f4! is enough) 23...¤xf4 24.gxf4 a5 with the advantage. 23.axb4 axb4 24.Ґe5 ¤f5 25.Јf4? A blunder that led to the defeat. After the only 25.Јe1! accuracy would required for Black's part. For example, White maintains the material balance after 25...Јd3 26.Ґxc3 with the following 27.Јxe6. 25...¤xg3+! An easy tactical combination provides Black with the decisive advantage. 26.Јxg3 ¤e2 27.Јe3. 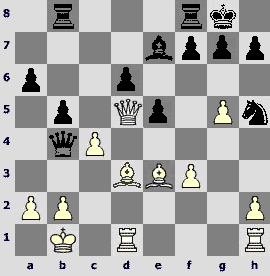 The following continuation doesn't help White either: 27.Јg4 ¤xc1 28.Јxe6 ¤d3 29.Ґd5 Јe8!°. 27...¤xc1 28.¦xc1 ¦xc1+ 29.Јxc1 ¦xf2 30.Ґa1? 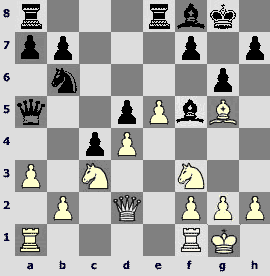 White could continue resisting by 30.Ґh3 Јd5+ 31.ўg1. Alexander Grischuk made a new move in the next game. The fact is that White posed serious problems to his opponent. 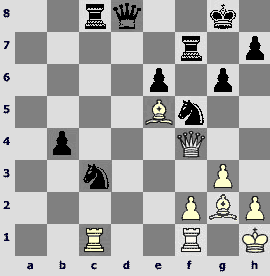 Black didn't manage to cope with the difficulties and his king was exposed to White's powerful attack. 17.a4!?N. Grischuk was the first who deviated from the game Onischuk – Aleksandrov (Poikovsky 2004). Onischuk preferred to struggle for the victory in the better endgame 17.¤e4 Јxd2 18.¤f6+ ўh8 19.Ґxd2. Probably, Valerij Filippov was ready for that variation. First of all, 17.a4 looks like to be a prophylactic move against the simplifying 17...¤a4. The weakness of the b4-square is of no importance. 17...¤d7 18.h3. White has a simple plan. He tries to prepare the advance of pawns on the kingside. 18...a6. This move seems to be unnecessary. 18...Ґb4!? deserves attention. 19.g4! White puts his idea into practice step by step. It seems that Black didn't worry about the counter-play. 19...Ґe6. If 19...Ґd3 20.¦fc1 threatening with 21.¤e1. 20.Ґh6 Ґb4?! Black can't keep on struggling without any counter-measures in the center. It was quite appropriate to play 20...f6! 21.¤g5 Јb6? A decisive error. Now it is too late to play 21...f6?! because of 22.exf6 ¤xf6 23.Јf4±. Black could prepare himself for White's assault by 21...ўh8!? If 22.f4, Black continues 22...f5 23.exf6 ¤xf6 24.f5 gxf5 25.gxf5 Ґg8 and the position is unclear. 22.a5! One more ulterior idea behind the White's 17thmove reveals itself.The coordination of Black's pieces is upset. The position seems to be critical. 22...Ґxa5. After 22...Јc6 23.f4 f5 24.Јg2 Filippov's position is hopeless. 23.f4 f5 24.exf6 Ґf7. Or 24...¤xf6 25.f5. 25.f5 Ґb4. On 25...¤xf6 White wins by 26.¦xa5. A resourceful 25...Ґxc3 26.bxc3 ¤xf6 27.¤xf7 ¤e4!? isn't a remedy on account of 28.Јe3 ўxf7 (28...g5 29.¦ab1 Јc6 30.¤e5 Јxh6 31.f6ќ doesn't help Black either) 29.fxg6+ ўg8 (on 29...ўxg6 White plays 30.h4! with checkmate) 30.g7 and White's victory is beyond question. 26.fxg6 hxg6 27.Ґg7. Black doesn't have a satisfactory defense against the enemy queen's transference to h4 via f2. Viorel Bologan crushed the experienced Rafael Vaganian. However, deep analysis showed that Black had enough defensive resources. So it is quite early to give up Vaganian's idea for lost. 1.e4 e6 2.d4 d5 3.¤c3 Ґb4 4.e5 c5 5.a3 Ґxc3+ 6.bxc3 ¤e7 7.Јg4 O-O 8.Ґd3 ¤bc6 9.Ґg5! ?A new way as compared with the well-known 9.Јh5. 9...Јa5 10.¤e2 ¦e8!?N. In spite of Vaganian's defeat, his ideas deserve serious attention. To my mind, Black can definitely defend this position. However, I didn't manage to find a certain way to White's victory. 10...¤g6 is the principal theoretical move. 11.h4 ¤xd4. Having strengthened his knight on e7, Black received a right to this move. 12.¦h3 ¤xe2?This error seems to be the first step on the road to the defeat.Black had to move back his knight in order to attack the other central pawn. After 12...¤dc6! the straightforward 13.Ґf6 ¤g6 14.Ґxg6 (14.h5 ¤cxe5) 14...fxg6 15.h5 gxf6 16.hxg6 ¤xe5 17.Јh5 ¦e7 18.gxh7+ ўh8 19.f4 Јc7 leads to the unclear position. 13.ўxe2! Perhaps, Black underestimated this move. Now it is very difficult to repel White's attack. The main menace is 14.Ґf6 ¤g6 15.h5. 13...¤g6.It turns out that on 13...c4? White wins by force after 14.Ґxh7+! ўxh7 15.Ґxe7 ¦xe7 (15...Јa4 16.¦a2 doesn't change any thing) 16.¦g3 f5 (or16...g6 17.h5ќ) 17.exf6 ¦f7 18.fxg7 ўg8 19.Јg6 Ґd7 20.Јh6ќ. 13...g6? doesn't help either:14.h5 c4 15.Ґxg6! fxg6 (15...¤xg6 16.hxg6 fxg6 17.¦xh7! ўxh7 18.¦h1+ ўg8 19.Јh3ќ) 16.Ґxe7! ¦xe7 17.hxg6 h6 18.¦xh6ќ. Possible is 13...ўh8 but the problem is that White can reply 14.Ґxh7! ўxh7 15.Ґxe7 Јb5+ 16.ўd2 and Black has to play 16...Јc4 17.Јxc4 dxc4 18.Ґxc5± as in case of 16...¦xe7 White wins by 17.¦g3 f5 18.exf6 ¦f7 19.Јg6+ ўg8 20.h5ќ. 15...¤xd3? No better is 15...c4? 16.Ґf6 cxd3+ 17.cxd3 ¤g6 18.hxg6 fxg6 19.¦xh7!ќ. Black's only chance consisted in 15...¤g4! 16.Јxg4 f5 17.Јg3 Јxc3 18.Ґb5! Јxc2+ (it seems to be stronger than 18...Јxg3 19.¦xg3 ¦f8 20.Ґe7 ¦f7 21.Ґxc5 or 18...Јxa1 19.Ґxe8 b6 20.Ґf7+!) 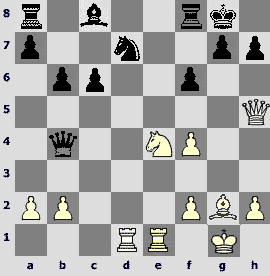 19.Ґd2 ¦f8 20.¦c1 Јe4+ 21.ўf1± – White's extra piece is more important than Black's pawns but all the struggle is yet to come. Alexei Shirov's game is of great importance for the Najdorf Variation theory. 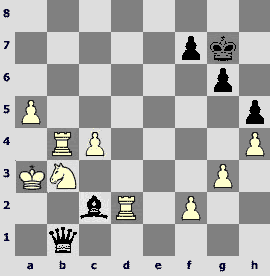 Black found himself in a difficult position in the openingand White gradually converted his advantage. 1.e4 c5 2.¤f3 d6 3.d4 cxd4 4.¤xd4 ¤f6 5.¤c3 a6 6.Ґe3 e5 7.¤b3 Ґe6 8.f3 Ґe7 9.Јd2 O-O 10.O-O-O ¤bd7 11.g4 Јc7 12.g5 ¤h5 13.ўb1 b5 14.¤d5 Ґxd5 15.exd5 ¤b6 16.¤a5. 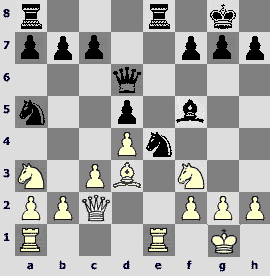 A topical pawn sacrifice in the popular variation. To be honest, recently White played 16.¦g1 more often. 20.Ґd2!N. A successful novelty. White has also tried 20.c5 and 20.¦d2 in this position. 20...Јa4.After 20...Јc5 21.Јxc5 dxc5 22.¦he1 f6 (if 22...Ґd6 White can reply 23.Ґa5! )both 23.g6 and 23.f4 look promising. 21.¦he1 bxc4 22.Ґxc4 ¦bc8 23.b3 Јd7. In case of 23...Јa3 White has 24.f4±. 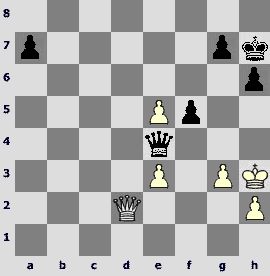 24.Ґxa6.The fact is that Alexei regained the pawn. Moreover, White still has the positional advantage. 24...¦a8. 24...¦c5 25.Јe4 ¦b8 26.Ґe3 ¦a5 27.Ґc4± doesn't resolve the problems either. 25.Ґb5 Јa7 26.a4! Having consolidated bishop on b5, Shirov deprived his opponent of counter-play. 26...¤f4?! An untimely activity. Better was 26...¦ab8. 28.Јd4! This move forces the exchange of queens. Then White simply exploits the power of his passed pawns. 1.d4 ¤f6 2.c4 e6 3.¤f3 b6 4.g3 Ґb7 5.Ґg2 Ґe7 6.O-O O-O 7.d5!? exd5 8.¤h4. 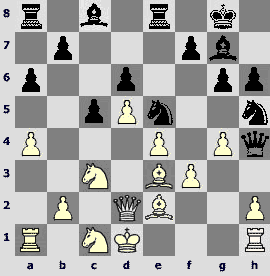 The opponents chose a well-known gambit variation that was put into practice by Lev Polugaevsky. 8...c6 9.cxd5 ¤xd5 10.¤f5 ¤c7 11.e4 d5 12.¦e1 dxe4 13.¤c3 Ґc8 14.¤xe7+ Јxe7 15.¤xe4 ¤e6 16.Јh5 ¤d7N.Up to now the players repeated the game Mamedyarov – Gomez (Oropesa 2001). Gomez tried 16...h6 in this position. 17.Ґg5 f6. Of course, Black can't take the bishop. On 17...Јb4 White could play 18.Јh4! Јxb2 19.Ґe7±. 18.Ґf4! 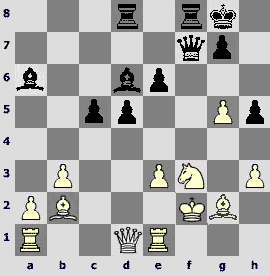 White demonstrates a deep and non-standard understanding of this position. The weakness of the d6-square is more important than the demolition of the white pawn structure on the kingside. 18...¤xf4. Bad is 18...Јf7? 19.Јxf7+ ¦xf7 20.¤d6ќ. I can only suggest 18...¦d8 as the alternative but the problem is that after 19.Ґd6 Јf7 20.Јxf7+ ўxf7 21.¦ad1± nothing can help Black. 19.gxf4. White threatens with 20.¤g5. 19...Јb4. If 19...g6 20.Јd1 ¤c5, White has the upper hand after 21.¤xc5 Јxc5 22.¦c1 Јf5 23.Ґxc6 ¦b8 24.¦e7±. 20.¦ad1. Now White threatens with 21.¤d6 followed by 22.¦e7. 20...¦b8? A decisive error. The only opportunity of continuing the struggle consisted in 20...f5! 21.¤d6 ¤f6 22.Јg5 ¤e4 23.¤xe4 (23.Ґxe4 fxe4 24.¦xe4 Јxb2 25.¦e7 h6!) 23...fxe4 24.Ґxe4 Ґa6! (24...Ґb7 25.Ґxh7+ ўxh7 26.¦e7 Јxb2 27.¦dd7ќ) 25.Ґxc6 (25.Ґxh7+ ўxh7 26.¦e7 Јxb2 27.¦dd7 Јc1+ 28.ўg2 Јf1+ 29.ўf3 Јh1+ 30.ўe3 Јe1+=) 25...¦ac8 26.¦e7 Јxb2 27.¦dd7 ўh8! (27...Јb1+ 28.ўg2 Јf1+ 29.ўg3 Јg1+ 30.Ґg2 ¦c3+ 31.f3ќ) 28.Јxg7+ Јxg7+ 29.¦xg7 Ґd3 with some chances of the draw. Vasily Ivanchuk amused the spectators with a new opening outburst. To my mind, his idea will definitely find it's followers and theoretical disputes will be continued. 1.e4 c6 2.d4 d5 3.e5 Ґf5 4.¤c3 e6 5.g4 Ґg6 6.¤ge2.The Frejman attack is the sharpest variation of the Caro-Kann Defense. 6...c5 7.h4 h5 8.¤f4 Ґh7 9.g5!? White usually takes on h5 but Ivanchuk has his own views on the theory. 9...¤c6 10.Јxh5!?N. A high-risk continuation. However, it is clear that Vasily prepared this move at home. White also tried 10.Ґb5 and 10.g6. 11...¤e7. The correctness of the White's idea depends on the assessment of the principled 11...¤xc2+ 12.ўd2 ¤xe3 (both 12... ¤xa1? 13.Ґb5+ ўe7 14. Ґxc5+ and 12...d4? 13.Ґb5+ ўe7 14.g6! dxe3+ 15.ўxc2 Јd2+ 16.ўb3 lead to the failure). It is possible to play 13.Ґb5+! ўe7 14.g6 fxg6 15.Јg5+ (striking 15.Јxg6? doesn't yield White a draw because of 15...¤f6! 16.exf6+ gxf6 17.Јh5 d4 18.Јxc5+ Јd6 19.Јxd6+ ўxd6 20.fxe3 dxc3+ 21.bxc3 e5 and Black has a serious advantage) 15...ўf7 16.fxe3 d4 17.Јxd8 dxc3+ 18.ўxc3 ¦xd8 19.Ґc4©. In my point of view, White has compensation for Black's extra piece but the resulting position is very difficult to evaluate. 12.Ґxd4 cxd4 13.¤xe6 Јb8 14.Ґb5+ ¤c6 15.¤xd4 Јxe5+ 16.¤ce2. Safer is 16.Јe2 Јxe2+ 17.ўxe2 ўd7 though Black has some kind of a counter-play for the pawn. 16...O-O-O 17.Ґxc6 bxc6 18.¤xc6. A sharp tactical skirmish begins. The analysis of various variations often leads to the draw but the problem is that life often makes amendments indeed. 18...Јe4! The idea of trapping White's queen 18...Јf5?! 19.¤xd8 Ґb4+ 20.ўf1! g6 turns out to be vain because of 21.¤d4! 20.¤xd8?! Stronger is 20.Јg4+! ¦d7 21.Јg1! 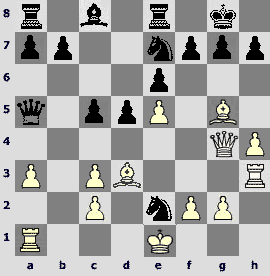 (White protects the h1-rook in case of taking on f3; weaker is 21.¤b8 ўxb8 22.Јxd7 Ґb4+ 23.c3 Ґd3 24.¦h2 ¦e8 25.cxb4 Јg1+ 26.ўd2 Јe3+=) 21...Јxg1+ 22.¦xg1 ¦c7 23.¤cd4 with the advantage in the endgame. 20...Ґb4+ 21.c3 ¦e8. Let me show you one more nice line that leads to a draw – 21...Ґd3!? 22.Јg4+ ўxd8 23.¦h2 ¦e8 24.¦d1 Јxe2+ 25.¦xe2 ¦xe2+ 26.ўf1 ¦d2+ 27.ўe1 ¦e2+=. 22.¦h2 Јg1+ 23.ўd2 Јxh2. Black could force a draw by 23...¦xe2+ 24.¦xe2 Јd4+ 25.ўe1 Јg1+=. 24...Ґd6? Black couldn't stand the strain and made a serious error. After the correct 24...Ґf5! 25.Јxf7 (25.cxb4? loses due to 25...Јe5°) 25...Јe5 26.Јxa7 ўxd8 White had to be satisfied with the perpetual. 25.Јxh7 Ґg3. 25...ўxd8 26.Јf5ќ is also hopeless. 26.Јf5+. Ivanchuk begins the series of checks in order to win several pawns. 26...ўxd8 27.Јxd5+ ўc7 28.Јxf7+ ўd8 29.Јd5+ ўc7 30.Јc4+ ўb6 31.Јd4+ ўc7 32.Јxa7+ ўc8 33.Јc5+ ўd8 34.¦d1! Forcing Black to place his king on the d-file, White makes the last preparatory move. Now it is impossible to repel White's attack. 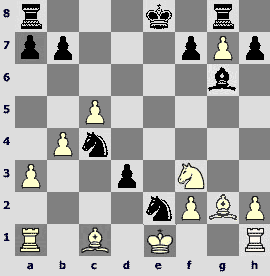 Andrei Volokitin punished his opponent for the groundless activity in the opening. The Ukrainian demonstrated an efficient refutation of the antipositional move 14.g4?! 1.d4 ¤f6 2.c4 g6 3.¤c3 Ґg7 4.e4 d6 5.f3 O-O 6.Ґg5 c5 7.d5 h6 8.Ґe3 e6 9.Јd2 exd5 10.cxd5 ¦e8 11.¤ge2 ¤bd7 12.¤c1 a6 13.a4 ¤h5 14.g4?! This decision seems to be too optimistic. 14.Ґe2 is more solid. 14...¤e5 15.Ґe2?! Better is 15.Јg2 Јh4+!? 16.Ґf2 ¤xf3+ 17.Јxf3 Јxg4 18.Јxg4 Ґxg4©. Black has enough compensation for a piece though. 15...Јh4+ 16.ўd1. 16.Ґf2 runs into 16...Јf6! In case of 17.gxh5, Black plays 17...¤xf3+ 18.Ґxf3 Јxf3 19.¦g1 Ґxc3 and he seems to have a decisive advantage. 16...¤xf3!N. It looks like a clear improvement as compared with 16...¤xg4 17.fxg4 Ґxc3 18.bxc3 Ґxg4 19.Ґf2› (Damljanovic – Pavlovic, Panormo 1998). 17.Ґxf3 Ґxc3! This continuation is more precise than 17...Ґxg4 18.Ґxg4 Ґxc3 19.Јg2. 18.bxc3. Probably, it is even worse to play 18.Јxc3 Ґxg4 19.Ґxh6 ¦xe4 20.¤e2 ¦ae8µ. 18...Ґxg4 19.Јe2 ¦xe4 20.Ґxg4?! 20.¦g1? loses at once because of20…¤f4! 21.¦xg4 ¤xe2 22.¦xh4 ¤xc3+ 23.ўd2 ¦xh4 24.ўxc3 ¦h3!°. More stubborn is 20.h3 but the problem is that Black continues 20...¦xe3! 21.hxg4 (or 21.Јxe3 Јg5! 22.Јxg5 Ґxf3+ 23.ўd2 hxg5µ) 21...Јg5µ and things are rough for White. 20...¦xg4?! The computer continuation 20...¤f6! 21.Ґf3 ¤xd5!° gains the victory quicker. 21.¦f1 ¦xa4 22.¦b1. 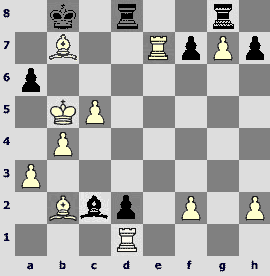 22.¦xa4 Јxa4+ 23.Јc2 Јxc2+ 24.ўxc2 g5µ leads to the difficult ending. 22...b5 23.Ґxh6 ¤f6 24.Јf3?! More viable is 24.Јe7! Јxh6 25.¦xf6 Јh5+ 26.ўc2 Јxd5 27.Јxd6. 24...Јxh6 25.Јxf6 Јh5+ 26.Јf3? This mistake lets Black finish the game in style. However, even 26.ўc2 Јxd5 27.¦e1 b4 can't help White either. Maia Chiburdanidze crushed the young Natalija Pogonina. To my mind, this game is an excellent example of how to exploit the development advantage. 1.d4 ¤f6 2.¤f3 c5 3.d5 b5 4.Ґg5 d6 5.e4!? The most energetic continuation. More often White exchanges on f6 beforehand. 5...¤xe4?! It was not the first time Natalija Pogonina played this variation. However, up to now she preferred 5...a6. The capture of the central pawn seems to be more dangerous and risky. 8...Јb6?N. Black tries to deviate from 8...e5 9.dxe6 Јxg5 10.exd7+ ¤xd7 11.0-0 Ґe7 12.¤c3 and White stands better as it was in the game Boersma – Ermenkov (Amsterdam 1985). Unfortunately, this novelty turned out to be a serious error. 9.O-O! Maia Chiburdanidze welcomes Black's intentions and punishes her opponent hard for wasting time on taking useless pawns. 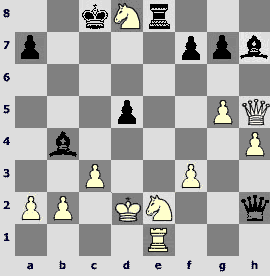 9...Јxb2 10.¤d2.White made only ten moves and to my mind, Black's position is hopeless indeed. The development advantage secures White's victory. 14.Јb1! 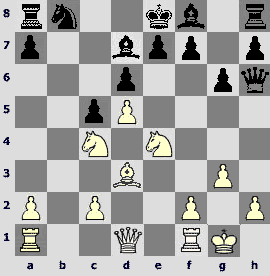 Black is helpless against White's queen flank attack. Liviu-Dieter Nisipeanu scored a spectacular victory. 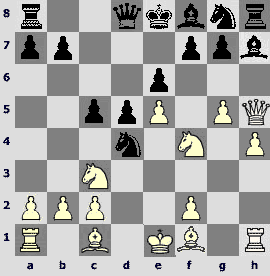 Having sacrificed a piece, he gradually strengthened his position and then used his opponent's inaccurate play. 1.d4 ¤f6 2.¤f3 e6 3.c4 c5 4.d5 b5. 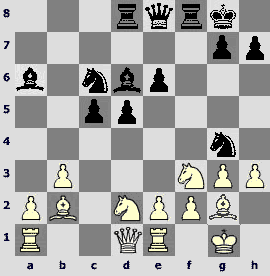 Recently the Blumenfeld Gambit is sometimes seen in the games of the strong players. Nisipeanu is one of those who often play this half-forgotten opening. 13.¤bd2 ¦d8 14.¦e1. White prepares to the advance in the center and Black decides to try to surpass his opponent. 15...¤xf2!? This sacrifice looks questionable but the fact is that it is always harder to look for the defensive moves than for the offensive resources. The present game confirmed this opinion. Let me add that in case of 15...¤ge5 16.¤xe5 Ґxe5 (on 16...¤xe5 White plays 17.f4 followed by e2-e4) 17.Ґxe5 ¤xe5 Black doesn't have enough compensation for the pawn. 16.ўxf2 ¤d4. Black accumulates pressure. If White exchanges on d4, Black will have the opportunity of advancing е6-е5. 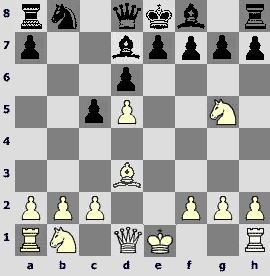 In this case White will not be able to play e2-e4. 17.g4. White has to make this move in any case. But maybe it made sense to wait until the black queen's would be on g6 and to make some useful move. For example, I can suggest 17.¦c1!? 17...h5 18.g5 Јf7 19.e3?! Probably, White overlooked his opponent's 20th move. Otherwise, he could play 19.¦c1 with possible continuation 19...Јf4 (neither 19...e5 20.e4 nor 19...¤xf3 20.exf3 is effective) 20.Ґxd4 cxd4 21.ўg1 e5 22.¤f1or 19.ўg1!? 19...¤xf3 20.¤xf3. On 20.Ґxf3 Black prepared 20...Јf5. 20...Ґh2! What a spectacular coordination of long-rage pieces! As though Black's bishop paves the way for the queen. 21.Ґf1? White doesn't stand the stress and makes a decisive error though it was quite difficult to find the only defense.. On 21.¦h1? Black plays 21...d4! (instead of 21...Јс7? 22.¦xh2 Јxh2 23.Ґf6!) Now neither 22.e4 Јf4 23.¦xh2 Јe3+ 24.ўg3 h4+ 25.ўxh4 Јf4+ 26.ўh5 g6+ 27.ўh6 Јf7° nor 22.exd4 Јf4 23.¦xh2 Јxh2° with unavoidable threats 24...¦xf3+ and 24...Ґb7 could save White. On 21.Ґh1? 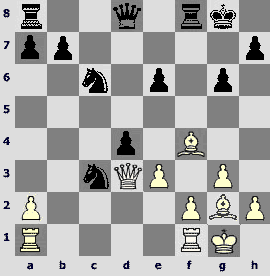 (with the idea of 21...Јc7 22.¦g1) Black also wins by 21...d4! It was possible to continue struggling by 21.Ґf6! Јc7! 22.¤xh2 Јxh2 23.Јf3 (dubious is 23.Јxh5?! because of 23...¦xf6+! 24.gxf6 ¦f8) 23...gxf6 24.g6. However, after 24...Јe5 Black retains the advantage. 21...Јc7°. Now White's king seems to be a pitiful sight. 22.Ґxa6 Јg3+ 23.ўe2 Јg2+ 24.ўd3 c4+ 25.ўc3 ¦xf3 26.Јd4. Otherwise, the d5-pawn moves on. For example, 26.¦e2 ¦xe3+! 27.¦xe3 (27.ўd2 Јxg5! 28.¦xe3 d4°) 27...d4+ 28.ўb4 Ґd6+ 29.ўxc4 dxe3° or 26.¦b1 d4+ 27.ўxc4 (27.ўb4 Ґd6+ 28.ўa4 ¦xe3°) 27...¦xe3 28.¦xe3 Јc6+ – Black checkmates in all the lines. 26...¦f2 27.Јb6. Neither 27.¦ab1 ¦b8! 28.¦ec1 Ґd6 nor 27.Ґa3 ¦b8 28.¦ec1 ¦xa2 change anything. 27...Ґe5+ 28.ўb4 ¦b8 29.Ґb7 Ґxb2 30.Јxe6+. On 30.¦ab1 Black wins by 30...¦f7. Now let me show you the games of Alexander Morozevich. The Russian's excellent performance in the final rounds of the tournament brought his team "Tomsk-400" the overall success. Let's begin step by step. Alexander Morozevich played quite vigorously in the game against Karen Asrian. It allowed him to excel his opponent in the development of the initiative. Moreover, it is very important in the positions with the opposite castling. 21.b4! The initiative is above all. 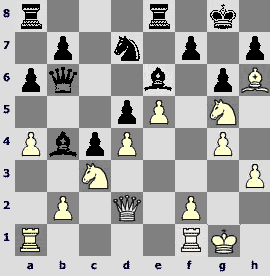 The following variation doesn't suit Morozevich - 21.Ґxg5 Ґxg5 22.Јxg5 f6. 21...c4 22.b5! White continues in the same spirit. 22...Јxb5 Black's position after 22...Јc7 seems to be hopeless: 23.Ґc2 Јd8 24.¦f1!? followed by f2-f4. 23.Ґc2 Јc6. Black's queen is vulnerable on this squarebut after 23...Јa6 24.Ґxg5 f6 25.exf6 gxf6 26.Ґf4+ Ґd6 27.¦e1 e5 28.Ґe3 exd4 29.cxd4 White also has the upper hand. 24.Ґxg5 f5?! After the active 24...Ґxg5 25.Јxg5 f6 Black has more practical chances. For example, after 26.Јxg7 ¦cg8 27.Јe7 ¦e8 28.Јb4 fxe5 29.Ґa4 Јc7 30.Ґxd7 Јxd7 White has to play 31.a6! b6 32.dxe5± instead of 31.dxe5? ¦xh2!that is in Black's favor. If 32...¦xh2?, White continues 33.ўxh2 Јh7+ 34.ўg1 ¦h8 35.Јd6+ ўa8 36.Јc6+ ўb8 37.Јb7+. 25.exf6 gxf6. Also hard is 25...¤xf6 26.Јe2±. 26.Ґf4+ Ґd6?! It was necessary to try 26...e5 though after 27.Ґa4 Black has a difficult choice between 27...Јc7 28.¦e1! (28.Ґxd7 ¦cg8 29.Јe6 exf4 leads to the unnecessary complications) 28...Ґd6 29.Ґe3 exd4 30.cxd4 and 27...Јd6 28.Јxd7 exf4 29.¦e1 ¦c7 30.Јxd6 Ґxd6 31.¦e6. White has the advantage in every variation. 27.Ґa4 Јc7 28.Ґxd6 Јxd6 29.¦e1. Black is unable to protect all the weaknesses. 29...¦he8. This move loses not only the pawn but also the game. However, 29...f5 30.Јg7 ¦hd8 31.a6! is not better either. 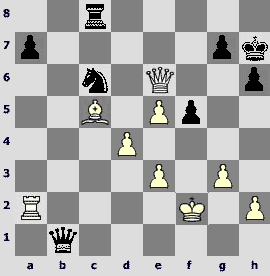 On 31...b6, White has 32.Јf7ќ. 30.Ґxd7 Јxd7 31.Јf4+ ўa8 32.Јxf6 ¦e7 33.¦e5 ¦ce8 34.¦ae1 a6 35.h4 ¦f7 36.Јg6 ¦ef8. On 36...¦g7 White wins by 37.¦xd5! Now let me show you Morozevich's risky improvisation. At first, the Russian grandmaster stood slightly worse. However, he defended ingeniously and managed to use the opportunity of tricking the opponent. 1.¤f3 d5 2.d4 ¤f6 3.c4 c6 4.¤c3 ¤e4?! Marshall's longstanding idea of changing Slav defense into the Stone Wall looks like to be quite shady. But the point is that Alexander Morozevich never plays conventionally. 5.e3 e6 6.Ґd3 f5. The Dutch defense is already on the board. 7.¤e5 Јh4 8.g3 Јf6N. 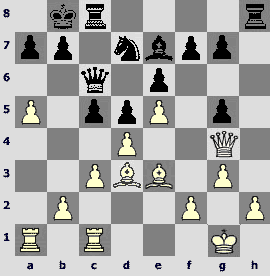 Before, Black played either 8...Јh3 or 8...Јh6 so that White wouldn't have 9.f3. 9.f3 ¤xc3 10.bxc3 Ґd6 11.f4 O-O 12.O-O b6 13.a4 Ґa6 14.cxd5 Ґxd3 15.Јxd3 cxd5 16.a5. One can assert that Black's opening experiment didn't justify itself. There are serious problems with the development of the b8-knight and the pawn structure leaves much to be desired. 17.¦xa5? An ordinary story. White loses the advantage by the most natural move. Stronger is 17.Ґa3 Ґxa3 18.¦xa3 protecting the knight from the exchange. It is also possible to play 17.c4!? dxc4 18.Јxc4 revealing the weakness of e6-pawn. 17...Јd8! Perhaps, White underestimated this maneuver. Black transfers his queen on the comfortable c7-square. 18.Јb5. A bit awkward move. Simpler is 18.¦a2. 18...Ґxe5! Morozevich eliminates his opponent's strong knight. Moreover, the Russian player manages to place his knight on the appropriate square. The worst thing is behind. 19.fxe5 Јc7 20.Ґa3 ¦c8 21.Ґc5 ¤c6 22.¦a6 ¦ab8. 22...¤xe5? 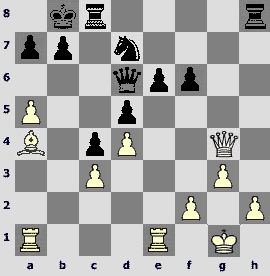 23.¦xe6 is in favor of White. Black will strike this tactical blow in the most suitable moment. 23.Јa4 ¦b2 24.¦f2 ¦xf2 25.ўxf2 Јb7 26.Јa2 h6! It is necessary to take care of the king on the threshold of the opening of the center. 27.c4. White prepared this move too long. Now it is not that strong. 27...dxc4 28.Јxc4 ўh7! 29.¦a2 Јb1 30.Јxe6? The following complications are in Black's favor. 30.¦e2 ¦e8 31.¦e1 maintained equilibrium. Perhaps, White was afraid of 30...Јh1!? but the point is that it is possible to play 31.Јxe6 Јxh2+ 32.ўe1. White's king leaves the dangerous zone. Now Black also runs risks. 30...¤xe5! 31.dxe5. Other continuations don't improve the matters either: on 31.ўg2? Black spectacularly wins by 31...¦e8! 32.Јxe8 (32.Јd5 ¤g4) 32...Јxa2+ 33.ўh1 (neither 33.ўg1 ¤g4 nor 33.ўf1 ¤d3 can help White) 33...¤f3 34.Јh5 Јb1+ 35.ўg2 Јg1+ 36.ўxf3 Јf1#. Black has the opportunity of realizing the same idea in case of 31.e4? ¦e8! 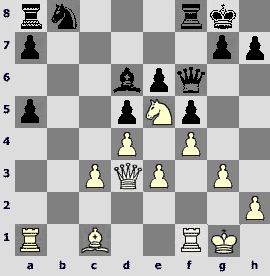 32.Јxf5+ (32.Јxe8 Јxa2+) g6 33.¦xa7+ ўg8° and White's queen is entrapped. If 31.¦d2, Black continues 31...¤g4+ followed by 32...¦b8 with a dangerous initiative. 31...¦xc5 32.¦d2 ¦c1 33.Јa6. It is also hopeless to play 33.Јd5 ¦f1+ 34.ўg2 ¦g1+ 35.ўf3 Јf1+ 36.¦f2 Јh3. 33...¦h1 34.ўg2 Јe4+ 35.ўh3 ¦g1 36.Јe2 ¦g2! White has no chances in the queen ending. 38...Јf3? This game would be less enthralling without a little adventure in the end. Simple 38...Јxe5 would have destroyed all White's hopes. 39.Јd7 a5 40.Јf7? 40.e6 Јf1+ 41.ўh4 Јg2 42.h3 could help White save himself. Now neither 42...Јe4+ 43.g4 Јf3 44.Јf7! (44.gxf5? Јg2!°) 44...fxg4 45.Јxf3 gxf3 46.e7 f2 47.e8Ј f1Ј 48.Јe4+ g6 49.Јe7+ ўg8 50.Јd8+nor42...a4 43.Јf7! Јd5 44.Јd7 Јe4+ 45.g4 fxg4 (or 45...Јxe3 46.Јf7 Јg5+ 47.ўg3) 46.e7 Јf3 47.Јd3+ g6 48.Јxg6+ ўxg6 49.e8Ј+ Јf7 50.Јe4+ Јf5 51.Јe8+ is enough for the triumph of Black. 40...Јf1+ 41.ўh4 Јf3 42.ўh3 Јg4+ 43.ўg2 Јe4+ 44.ўf2 Јxe5. Now comment is superfluous. The last round victory has a special value. Morozevich played a non-standard variation and achieved only a little advantage. However, Boris Gelfand was very nervous and unfortunately, made errors in the decisive moments of the game. 1.e4 e5 2.¤f3 ¤f6 3.¤xe5 d6 4.¤f3 ¤xe4 5.d4 d5 6.Ґd3 ¤c6 7.O-O Ґe7 8.c3. A rare bird. 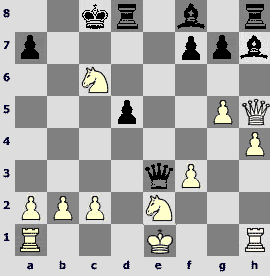 White avoids the deeply explored variations that begin after 8.c4 or 8.¦e1. 8...O-O 9.¦e1 Ґf5 10.Ґf4 ¦e8 11.Јb3N. White provokes 11...¤a5. Formerly he played 11.Јc2 immediately. 11...¤a5 12.Јc2 Ґd6 13.Ґxd6 Јxd6 14.¤a3!? An original way of development. The standard 14.¤bd2 drains the position. 14...Јf4. It is rather interesting to play 14...a6!? 15.¤e5 ¤c6 16.¤b5!? ¤xe5 17.dxe5 ¦xe5 18.¤xc7. Black has an isolated pawn but it seems to me that the game is still even. 18...¦d8 19.¤b5 Ґg6 20.¤d4 ¤c5. Probably, it was better to play 20...¦de8 keeping up a tense struggle. 21.Ґxg6 hxg6 22.g3 Јf6 23.¦xe5 Јxe5 24.¦d1 ¦e8 25.¦d2 Јf6 26.ўg2 ¦e5?! A wrong decision. Black's rook seems to be rather awkward on the 5th rank. 26...Јa6 is quite stronger. 27.¤f3 ¤e4. On 27...¦f5? White continues 28.Јd1! Јd6 29.c4± and Black loses d5-pawn. 28.¦e2 ¦f5 29.Јd3. White stands slightly better after 29.¤d4!? ¦e5 30.Јa4 a6 31.Јd7 ¤d6 32.¦xe5 Јxe5 33.Јd8+ ¤e8! (Black could lose spectacularly after 33...ўh7? 34.¤f3 Јf6 35.¤g5+ ўh6 36.Јh8+!! ўxg5 37.Јh3!ќ) 34.¤f3 Јe4 35.Јc8І. 34...¤xd4? Of course, White stands slightly better but the point is that Black shouldn't have exchanged the pieces. 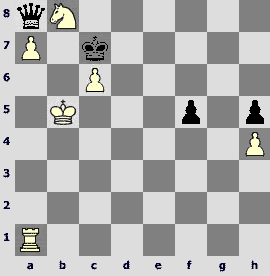 Black's last move leads either to the loss of a pawn or to the hopeless rook ending. Significantly better was 34...b6 35.Јe5 Јc4І. 35.Јxd4 ¦e6 36.ўf2 Јb6? After 36...¦e8 37.Јxd5 Јb6+ 38.Јd4 Јe6 39.ўg2± it is quite possible to defend the position especially as White's king is rather weak. 37.Јxb6 ¦xb6 38.ўe3. The rest needs no comment. In conclusion, let me show you a very nice game. Black's queen got into a scrape. However, that tragicomic situation seems to be typical of the studies but not of the practical game. 47.¦xc2! It is not the only but the most forceful way to the victory. 61.ўa6! A picturesque position. Having the black queen nicely wrapped up White can begin to convert an extra rook.